Today we don't think much about horsepower—as in the actual power of a horse! But in Biblical times what the mighty steed was capable of was pretty awe-inspiring. Fans of Ben Hur will remember Charlton Heston's great chariot race. These days we measure horsepower by what is under the hood. But even then, the fastest automobile is humbled compared to the power generated to launch missiles or space shuttles. 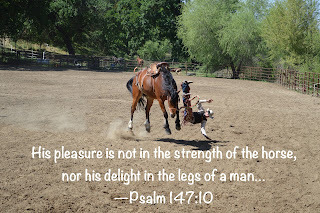 But we get the message when the psalmist writes: "His [God's] pleasure is not in the strength of the horse..." (Psalm 147:10). One horse power, or many, as beautiful as those may be, do not reach His highest standard. What's under the hood doesn't impress Him. Rocket fuel can't hold a candle to the sun. None of it holds up all the time, under every circumstance. My friends in the north have already had their first skiff of snow. When I went downstairs to make my coffee this morning I noticed that the car had frost on it—the first of the season. The inevitable is happening. Winter happens. Be it mild or fierce, it is sure. Just as surely comes the inevitable need to face a much bigger issue than frost and snow flurries. At some point in life every one of us has to face the offenses we have committed against God—what the Scripture calls sin. One of the ladies we worked with in Caracas was always quick to remind us that David, often held up as a godly example, was not perfect. If Elizabeth knew nothing much else about the Bible she certainly knew the story of David's sin against Bathsheba and her husband, Uriah. God did not seek to hide the sin of one of His own. In recording David's sin, and its consequences, the Almighty also provided the backdrop for a wonderful description of the remedy for that sin. In 1979, a gal by the name of Lillian Heron gave me a copy of the New International Version of the Bible. I have pretty much worn its cover and its pages out over the years. It has become my favourite copy of the many I have. I suspect it is my favourite because the print is large and the margins are wide, allowing me to write notes throughout. 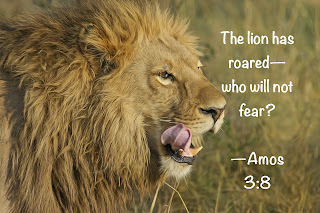 When I come to Proverbs 3, just about all thirty-five of the verses have an asterisk beside them. At some point I went through the chapter and put a mark beside all the benefits of wisdom that the chapter mentions. 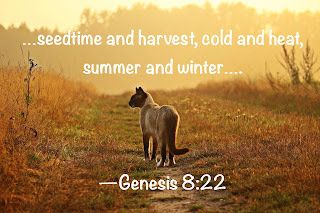 Proverbs is a book of wise advice, but this chapter specifically focuses on the good stuff that comes when godly wisdom becomes a chief characteristic of a believer. 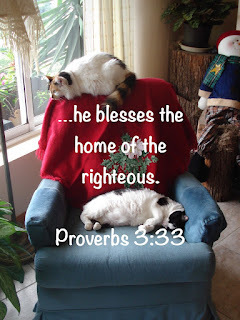 Today as I sit in my new office with a new desk and a new chapter in my life's book before me, I was reminded of the words of Proverbs 3:33: "...he blesses the home of the righteous." 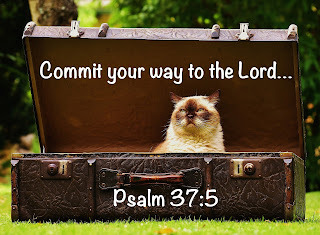 Some of the best known verses of the Bible are found in Psalm 37. We cling to Psalm 37:4-5, claiming its promises particularly when faced with decisions that need making or challenges that need facing. In their context these verses are words of encouragement to those who are surrounded by evil and might be tempted to cave to the status quo, or wonder if it is worth it to follow God when it seems like the odds are on the side of evil men rather than on the side of good men. It would be safe to say that our friends to the south are feeling some anxiety as November approaches. I don't blame them. How do you choose when there appears to be no choice? And we in the north have our problems too when it comes to those in political and economic authority who have lost contact with the real world of their constituents—if they were ever connected at all! 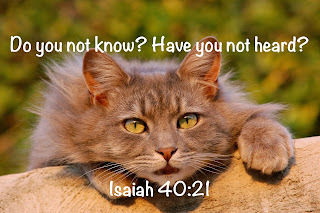 Well, Isaiah has an observation for all of us who are feeling a little, or a lot, overwhelmed. and reduces rulers of this world to nothing. It kind of snuck up on me. The deep greens of the bush beyond the town became yellow with the occasional tinge of red without me really noticing the change. With all the busyness of sorting and packing, I had to consciously stop to smell the crispness in the air and mentally process the arrival of Fall. And here we are at Thanksgiving weekend. Chorus: Great is Thy faithfulness! It was, to my mind, an unfortunate choice of title. A very popular author has published a 12-day devotional entitled Making Sense of God. I'll give him the benefit of the doubt and say that he probably didn't think through the implications of that title: what it suggests about him and what it suggests about God. If he had written six volumes of 2,000 pages each on the subject he still would not have met the mandate suggested in that title. It wouldn't put a dent in our understanding of God. A 12-day devotional doesn't cut it and to suggest that it could is presumptuous even if the author really didn't mean it. 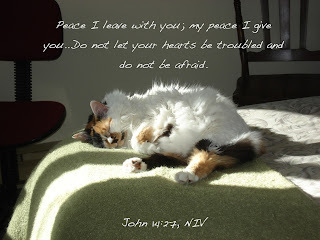 Isaiah sums it up: "'For my thoughts are not your thoughts, neither are your ways my ways,' declares the Lord. 'As the heavens are higher than the earth, so are my ways higher than your ways and my thoughts than your thoughts'" (Isaiah 55:8, 9). I remember that Sunday as if it were yesterday. The pastor's wife, Mrs. Wood, was in charge of the Sunday School department of which I was a part. I think it was the Primary Department so I was somewhere between six and eight years old. My task for that particular morning was to recite Psalm 1 from memory. I did it—and got a prize for doing it (I still have that bookmark)! To this day I can recite that chapter of the Bible. That experience, (among others) makes me an advocate for Scripture memorization in Sunday School. If kids don't remember anything else they learn in Sunday School, make sure they have the Bible in their heads. Sooner or later, it will filter down to their hearts as the Spirit of God works in their lives. 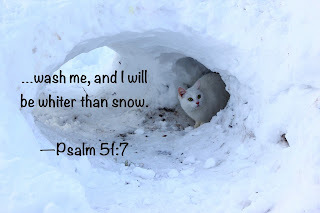 The Lord promises that His Word will never return to Him without accomplishing what it was sent to do (Isaiah 55:11). 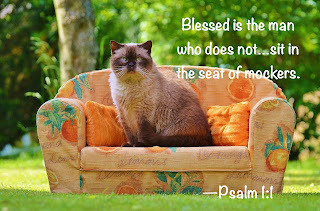 Psalm 1 begins with any preacher's ideal three-point sermon. 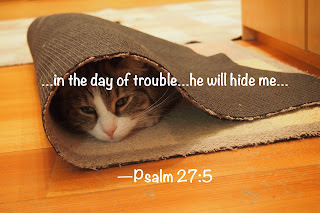 Battered by circumstances and emotions beyond his control, David writes: "...in the day of trouble he will keep me safe in his dwelling; he will hide me in the shelter of his tabernacle and set me high upon a rock" (Psalm 27:5). Change. It's never easy to deal with. Whether those changes are minor or major, they bring with them certain consequences. Some of us deal with those consequences without too much trouble. Others struggle a little more. But we all struggle. When Abby and Lou Lou came to Canada from Venezuela, I was told that, once released from their carriers, they would likely find some place to hide and stay hidden for up to two weeks. When we released them, they ran to the nearest closet. That was expected. But, much to everyone's surprise, within 45 minutes they were out making themselves at home as though they had always lived in their new quarters. The change caused some stress, but not much.